Write in the voice of your favorite writer. Jeff Goins cue made me think of the many possibilities. I settled to try and write in the voice of “Mrs. Dalloway”. In the first scenario of a 52 year old Mrs.Dalloway in Tripoli we tried to see the life of a now bored wife of a rich businessman whose many personal and professional affairs she tolerates, for the sake of her social position and mask and her children. In the second scenario an imaginary 52 year old expatriate worker, who has done some things in her personal life, and now is living Ibsen’s reality- The sins of the fathers are visited upon the children. Laughing and delightful, she had met Carlos in the church. They became friends and one of the old timers told me that he was not her first or even legal husband. As we walked up the stairs of the office to the pension department he told that these were the papers of her first and legal husband from whom she had no children. “He was a thorough gentleman, though weak in some ways which Carlos satisfied her,” Sam revealed an aspect which was not known to many who had always seen Carlos and Mariam happy married. She cannot call back her first legal husband whom she has not seen for almost twenty years. She cannot leave Carlos from whom she has a mentally retarded blind daughter. She pays for the housing and tickets of the first “legal” family of Carlos whom he has called from Pakistan to try their hands in post-revolutionary Libya. “These are things I cannot tell anyone,” she confided in Sam as they met over coffee. He kept silent as he knew her first husband well, a regular church-goer, who had first introduced Carlos to her. Now he is back in Mumbai in India and rebuilt his life. When upset, he would go for long walks by the beach, feeding cows and crows. “Do not tell Carlos about my salary hike,” Mariam told Sam. “Now his family has come and are staying in the house. I have to swallow because of my daughter.” They drank tea in the gentle sea-breeze coming from the Mediterranean, on a quiet Friday afternoon in the surgery ward. Her great toe had been amputated last week. Complications of chronic diabetes , they wrote in the case sheet. However, Sam knew that this was related to the family which came from Pakistan last week. 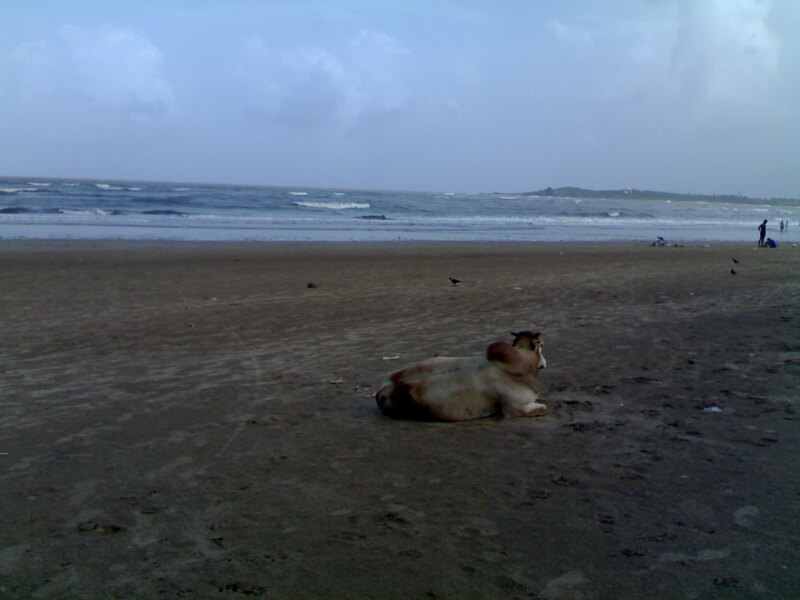 On returning to his home in the evening, Sam reflected on the many stories which the cows back home must have been witness to, in the beaches of Western India. Both these are used in Virginia Woolf’s “Mrs.Dalloway” and can be an effective tool to go into the minds of the protagonists, their social settings. This entry was posted in life and tagged 500 words a day, Diary, Indian Diaspora, Mrs. Dalloway, Tripoli Reading Group, Virginia Woolf. Bookmark the permalink.